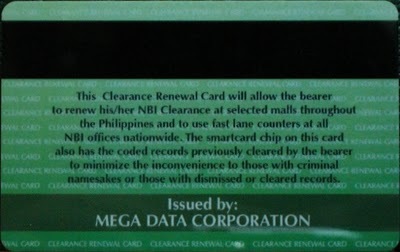 NBI Clearance & Renewal Card, Do You Already Have Both? The NBI Clearance is a major documentary requirement for Filipinos, almost a mandatory requirement for employment and serves a host of other purposes. New grads or those just entering the workforce will almost certainly be required to get one while veteran workers may be required to renew from time to time. The National Bureau of Investigation (NBI) has long been offering a faster means of renewing one's NBI clearance via the NBI Clearance Renewal Card. Companies or employers require an NBI Clearance as prospective employee's proof that he/she has no legal/criminal liability. The NBI issues a clearance certificate if the applicant has no record on file (also referred to as nbi clearance hit) with them. I recently applied for a new NBI clearance. The NBI Clearance Center is currently at the Victory Central Mall in Caloocan City. New applicants are required to present two valid IDs ( PRC ID, SSS ID, TIN ID, School ID, Company ID etc). I just brought my NSO-Certified Birth Certificate. Those for renewal just need to present their old NBI Clearance certificates. Here are the steps for New Applicants in obtaining an NBI Clearance that I recently undertook. Get an application form. You will be asked for IDs. Fill out the required information. A Birth certificate comes handy as the birthplace of parents are needed info to fill out the form. After which, you need to have your application form verified at the Data Check counters. Next step is paying the clearance fee of Php 115.00. Bringing a Php 100 peso bill plus three 5-peso coins can facilitate your payment. There are automated machines inside the center accepting exact payment. As much as possible, avoid going there during lunch break as there will only be a few cashiers who will man the payment counters, translating to longer lines. An official receipt will be given after payment. Next step is Finger Printing. It would be wise to bring tissue paper to clean the ink off your fingers as the Php 2.oo wet tissue being sold won't be enough to wipe off the ink completely. Then, your image will be captured. You just need to present your official receipt at the next step, wait for your clearance certificate to be printed and you're done. Your NBI clearance is valid one year from the date of issue. You will be issued two copies, one that you can give to your prospective employer and another for your personal copy that you will use for renewal. However it would be wise to get an NBI renewal card. It costs an additional Php 120.00 but it promises an easier way to renew your NBI clearance from then on. And you get to keep another official government ID card. For renewal, NBI clearance renewal machines (also available in selected malls) will only require you to swipe the NBI card, pay the exact fee, wait for your clearance print out and off you go. Getting the renewal card should only take a few minutes longer. Your picture will be taken again together with your right thumb print and the card will be printed immediately. Or call the NBI Clearance Center via telephone numbers 351-4149 and 351-0619. #717 Old Victory Liner Cmpd. Rizal Ave.
We hope that jobseekers can complete all the documentary requirements as easily as possible including an NBI Clearance and an NBI Clearance Renewal Card.